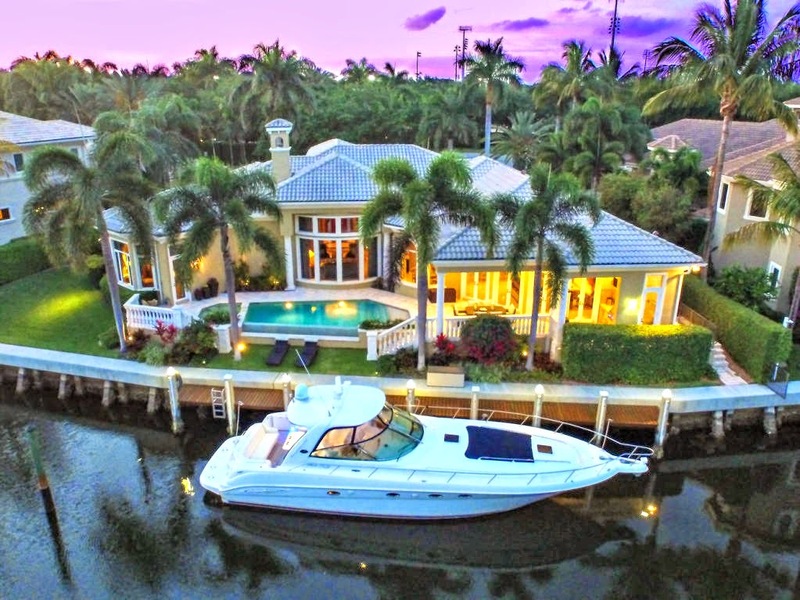 Perfectly situated along 150 feet of coveted water frontage within the exclusive community of Harbor Isles in North Palm Beach, Florida is this truly exceptional waterfront home. This Mediterranean inspired Harbor Isles residence boasts just over 5,300 square feet of single level living space with 3 bedrooms and 4.5 bathrooms. The handsomely customized interior captures splendid water views and features countless deluxe appointments including soaring 20’ cathedral ceilings, a striking raised entry, fabulous faux finished walls and numerous custom built-ins. The awe-inspiring backyard is a sight to behold with its Infinity edge pool and spa with fortune stone surround, private boat dock, sparkling water vistas and a lanai with a fully equipped Summer kitchen. Additional features include an expanded family room, gracious Master suite with sitting area and spa bath, en-suite guest rooms with walk-in closets, new exterior paint, new A/C units, new driveway pavers, new landscaping, new water heater, new pool heater and a 3-car side loading garage with extra storage. 764 Harbour Isles Way is located in North Palm Beach and is currently asking $2,649,000. This Harbour Isles listing is courtesy of Bwg Realty MLS# RX-10127150. Harbour Isles is a premier waterfront community nestled along the Intracoastal Waterway in the quaint coastal town of North Palm Beach, Florida. Residents of this gorgeous gated community enjoy easy access to a variety of area attractions including nearby Gardens Mall, MacArthur State Park and Harbourside Place. Miles of pristine Atlantic coastline are also just up the road in Jupiter and Juno Beach.